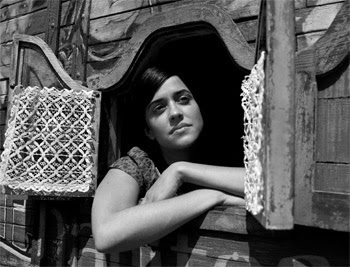 Blancanieves begins with a series of stills: black and white images of urban Spain in the late-1920s. They prepare us for the journey to come. But look carefully and you’ll see that the stills move: gentle ripples of water in one, rustling leaves in another, and so on. This, too, prepares us. Blancanieves, even its quietest moments, pulses with life. This is not an average film in any way. For one thing, it’s a modern silent: the work of Spanish director Pablo Berger, who struggled for years to get it made. 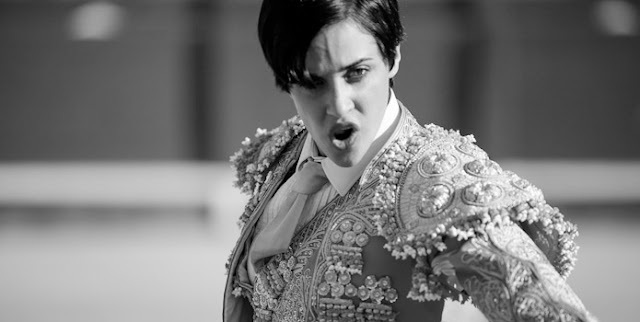 Pitched before The Artist made its global splash, Blancanieves: a feature-length, pure silent film about an amnesiac girl bullfighter, was a tough sell. It probably would be even now. To those who stood in the way of this film’s production, we must show forgiveness, and be thankful they failed. To describe Blancanieves properly is to describe the feeling of watching it—the way it innervates with image and sound. It’s scored to Latin music, much of it upbeat, almost all of it danceable. It’s often fast: quick cuts and sudden close-ups livening many scenes. And, yes, it is beautiful. Elegant, graceful, exquisite—all the usual clichés applied to silent films by those trying to promote them. But Blancanieves has swagger, too. And I think you’ll leave the theatre with a little swagger yourself. The film is split more or less in half. 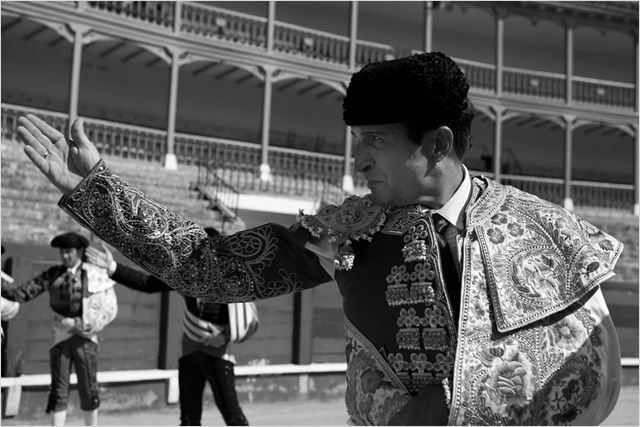 Part One introduces us to Antonio Villalta (Daniel Giménez Cacho), Spain’s greatest bullfighter and a great celebrity. In the movie’s opening minutes Antonio is gored by a bull: a scene filmed in the style of (and on par with) the fight sequences in Raging Bull. Antonio is rendered quadriplegic, and the shock of his accident forces his pregnant wife into labour. She dies in childbirth. The child is Carmen. Rejected in a moment of grief by her father, she is taken in by her maternal grandmother, who raises her to about the age of eight. Antonio, meanwhile, remarries: this time to a gold-digging nurse names Encarna (Maribel Verdú). He becomes a recluse: forgotten by the public and ignored by his wife. Sofía Oria, as the young Carmen, is a delight. A gifted dancer and a sensitive actor, too, she escapes the trap of her own cuteness—something a lesser film would have made difficult. When circumstances send her to live in her father’s mansion, Carmen quickly makes an enemy of Encarna, whose villainy reaches Disney-esque proportions. But she proves a light of hope for her dad. Giménez Cacho and Oria play together as though they were truly father and daughter, in speechless scenes worthy of Terrence Malick’s best work. 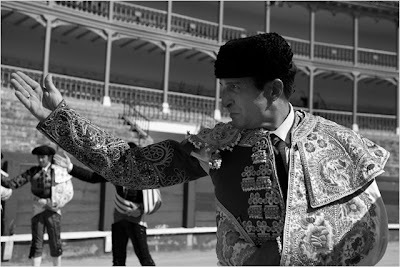 Antonio, from his chair, also teaches Carmen the basics of bullfighting. Years pass. Macarena García takes over the role of Carmen: now a young adult, still in the mansion, still training secretly for a career in the ring she can never have, and still despised by Encarna. Her stepmother’s hate finally turns murderous, and Carmen is left in the woods, her memory and identity lost. 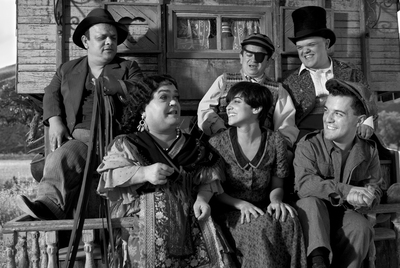 She’s saved by a troupe of bullfighting dwarves (only six)—the Spanish equivalents of rodeo clowns. They take her in, and when her skills and beauty improve their notoriety, they rebrand her. She is now “Blancanieves,” their Snow White. In a fairy tale story like this, you might expect the heroine to follow a clear trajectory. Cast out by her wicked stepmother, she will seek vengeance upon the woman and restore her name. But Carmen doesn’t exactly do that. It would be fair to ask Berger where he thinks his film is going in its second half. And if he thinks it has any point to make. I can’t quite answer that, nor, frankly do I care much. Blancanieves worked for me the way a fireworks display does: as a series of juxtaposed spectacles, made musical through smart timing and an avoidance of excess. Those shows don’t say much either, but their impact is tremendous. A few words about Maribel Verdú. Her Encarna is a highlight of Blancanieves; a conniving spider of a woman who also provides most of the big laughs. She’s rotten to the core, and fun because of it. And, because this is a silent film blog, I need to point out her resemblance to The Artist’s Bérénice Bejo. It’s so close I have to wonder if this is what a silent film actress is supposed to look like nowadays. Two of the dwarves merit special mention too. Emilio Gavira, as Jesusín, is effective as the star of the troupe, whose celebrity is supplanted by Carmen’s—and who’s wounded enough by that to start plotting. And handsome-faced Sergio Dorado, as Rafita, pulls us in with his clear, true, pure love for Snow White. Silent film is the ultimate visual medium for expressing feeling, and Dorado proves to be in his element. Blancanieves is a great movie. I left the theatre happy I’d seen it. I left the theatre happy, period. That’s not a clue to the ending, by the way. It’s just proof of the film’s quality. When this one comes to your theatre, you will buy a ticket, and sit, enthralled, for nearly two hours, just like I did. I just know it. Bold, powerful, dramatic and expertly made—movies like Blancanieves are the reason I go to the movies. Blancanieves screened Monday afternoon, August 10, 2012, at the Cineplex Odeon Yonge & Dundas Cinemas, in Toronto; part of the Toronto International Film Festival. Read an interview with the director, Pablo Berger, here. I have a work colleague that was raving about this film too. I thought I was your TIFF silent film date Mr. Edwards?? Ideally yes, Michelle; but in this case, you'd have had to ditch work!